I am a big fan of the pig. His tasty bits from ham to bacon are welcome on my table anytime. During holidays I stock up on Ham while it's on sale and keep them nestled in the freezer for a rainy day, or a warm one at that. 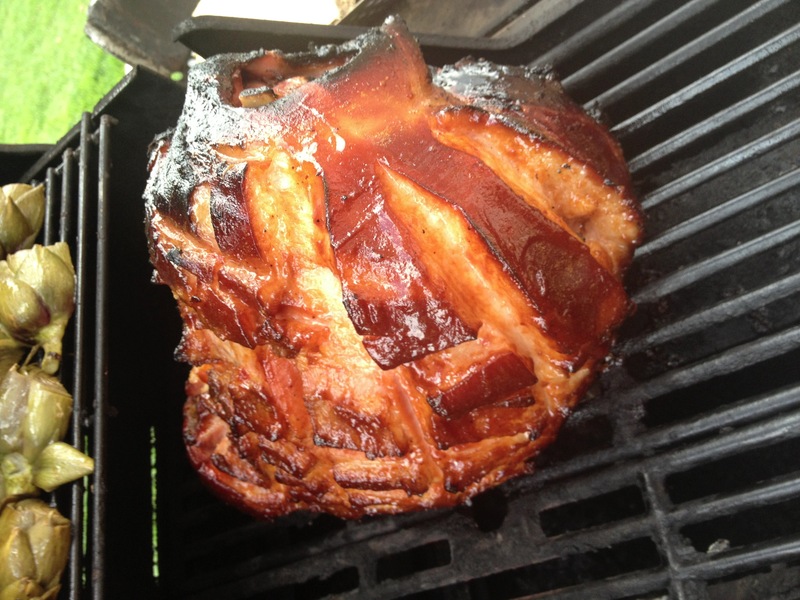 This easy BBQ ham recipe is better on an overcast day, because we use the oven. 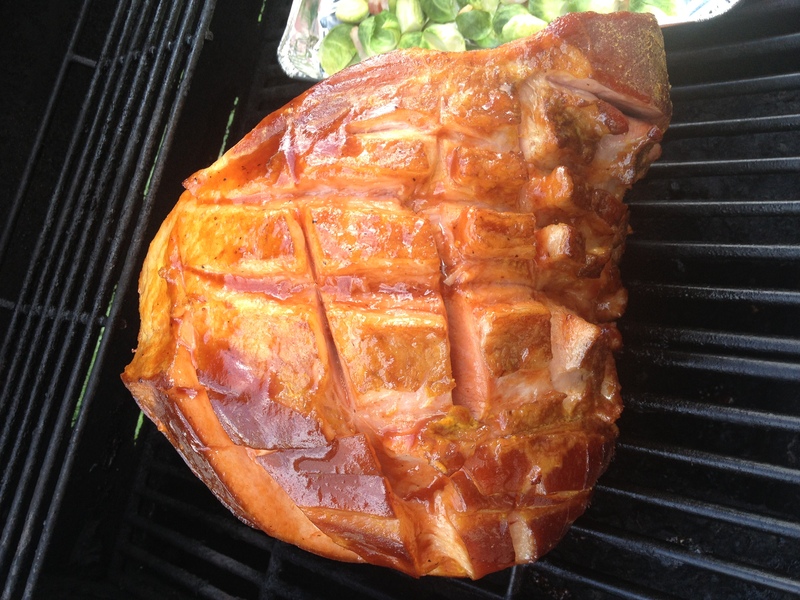 If you have the patience, and the propane, you could do this entire ham on the grill. 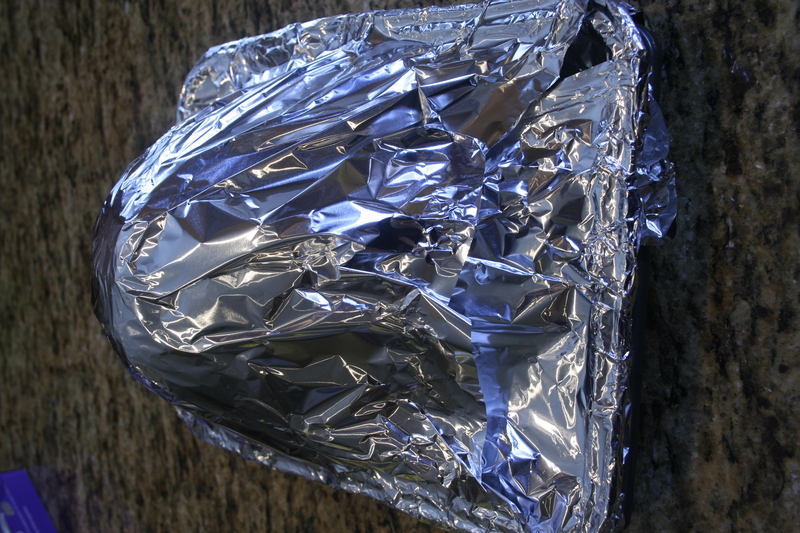 I'd cook it in an aluminum pan, covered tightly, for about 1 1/2 hours at around 300 degrees - then follow the rest of the steps outlined below! You wont be sorry! Here are the steps in pictures, the printable recipe will follow! 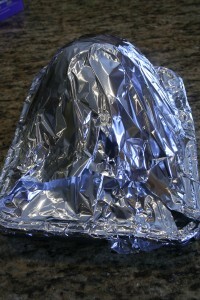 Cover tightly with foil and bake for about 2 hours at 325 degrees. 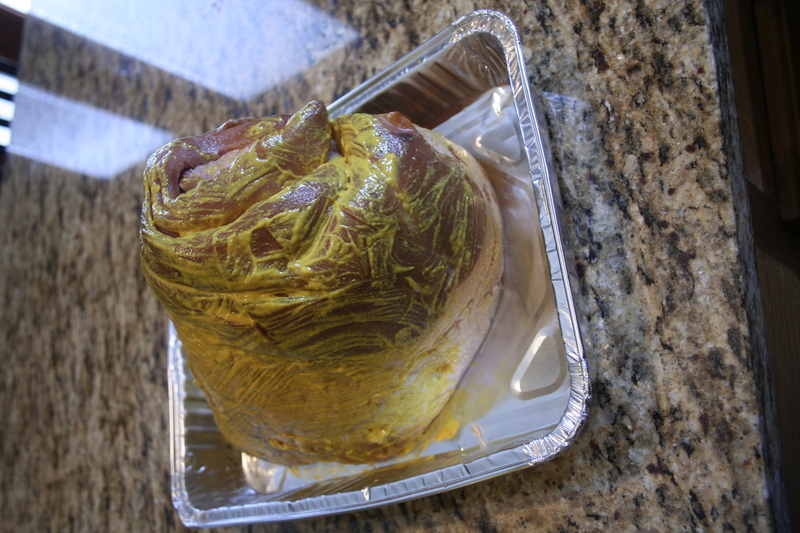 NOTE: this is a fully cooked ham, technically it just needs to be heated through. 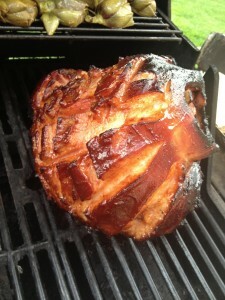 Once the ham comes out of the oven, place it on a medium hot grill and start basting on your BBQ sauce. 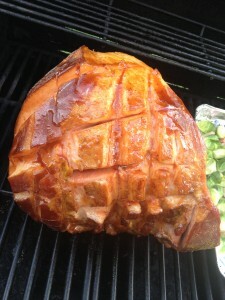 I baste about every 15 minutes, being sure to get all sides EXCEPT the one I chose to be the "down" side. 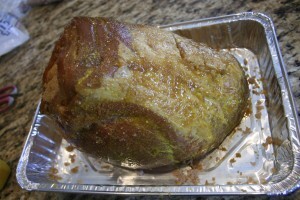 Because ham is fatty, it will burn - and the sugary BBQ sauce doesn't help. The thick layer of skin and fat on one side of a shank ham can protect the meat nicely, I usually place this piece "down" on the grill and just let that bit burn and spin the ham around to baste it. This is our porcine friend with 1 coat of BBQ Sauce just after I put him on the grill. After baking you can really see the scoring you did before you slid him in the oven. Keep basting and turning him on the grill. I roasted brussels sprouts with bacon and baby artichokes while I painted on Mr. Oink's tasty bbq sauce. When you have a nice bark on the outside, and your side dishes are done, Mr. Oink is ready for the table. I try to keep him on the grill for about an hour if possible. Here he is right before I took him inside and we devoured him! So that's the process! Here's the recipe! Enjoy! 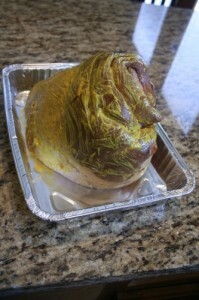 Bake at 325 for 2 hours - or place covered on a 300 degree grill for about 2 hours. 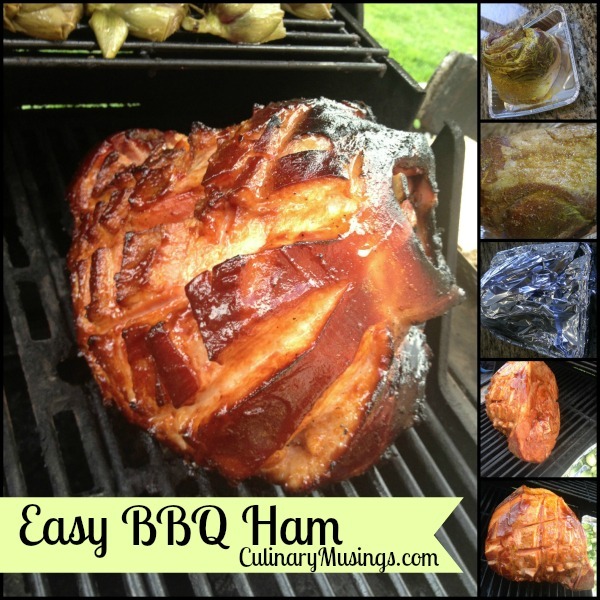 Once the ham is done baking, remove from pan and place, skin or thick fat layer down directly on your medium grill rack - you want the temp to run around 400 degrees for this. Rotate and coat with your favorite homemade or store bought BBQ sauce. Brush more sauce on every 15 minutes or so for about an hour. Remove from the grill, trim the burnt fat layer off, slice, and serve. Roberta, this is starts with a fully cooked ham and then kicks it up a notch by creating a delicious crust and additional flavor.